If you like what you see, it’s time to verify that the roofer carries workers’ compensation coverage and at least $1 million of liability insurance. Get his agent’s name and proof-of-insurance certificates. Then get an estimate, which should be free. 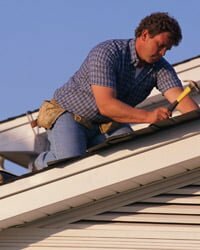 Because roofing is a short-term job, break up the total due into two payments: one-third up front for materials, and the remainder when the roofing and cleanup are done to your satisfaction. Also insist on a warranty that covers leaks, flashing failure and other labor-related defects. A one-year warranty is the minimum, though two or three years is preferable. These same stipulations should go into the contract, which should also include what type of roof will be used. Request the highest-rated, longest-lasting shingles you can afford. Several other quality checks will also help you ensure a leakproof job for decades. 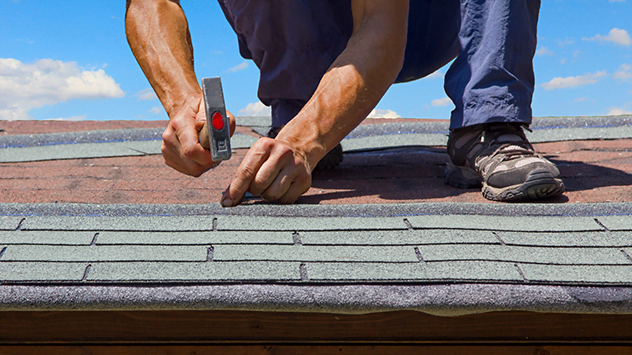 Replacing valley and eaves flashing is cheapest and easiest when reroofing, so do it now. Also have pipe boots or roof jacks replaced to direct away water where pipes or gas vents protrude. Leave chimney flashing alone if it’s in good shape; otherwise, have the roofer call in a mason. Now is also the time to make sure you have proper attic ventilation. Have it checked by the roofer or an HVAC contractor. Poor airflow can heat an attic to 130°F in summer. In winter, moist interior air can condense on the underside of the sheathing, rotting it. You may want to have ridge and soffit vents installed to circulate cool air into the attic, alleviating both problems. If you suspect some of the plywood decking beneath the shingles is rotted, put a small allowance, say $200, in the contract for replacing it. Clearly state that you must approve any charges above this amount, and that you get the money back if the decking is in good condition. Ask how the roofer will protect bushes and plants (roofers usually use plywood). Draw clear lines of responsibility for any damaged plants. Find out how the trash will be disposed of and nails picked up. Be sure Dumpsters or trucks used for garbage pickup don’t roll onto a new lawn or over an underground sprinkler system. What’s more, there should be thick plywood under Dumpster or truck wheels to protect the turf or driveway. An alternative is to pay extra and have the old shingles carted by hand to the curb. Finally, trust your intuition. If a roofer rubs you wrong, even at the contract stage, don’t be afraid to back out before signing, and resume your search. Unless water is pouring in overhead, it pays to take your time on this major investment.